A parquet floor is usually made from small blocks or strips of wood which are fitted together like a mosaic or puzzle and laid on a flat surface to create a regular and geometric design. Sometimes, parquet can be made from different types of wood with varying grains, to create a unique and eye catching pattern. Pronounced "Parkay", the French word parqueterie is the most likely origin of the word parquet and its use dates back to the early 1600's with a fantastic feature created for the Sun King - Louis XIV in the Hall of Mirrors at the Palace of Versailles in France. These beautiful intricate patterns have been adopted as an icon of elegance in expensive homes and palaces throughout the world ever since. The parquetry inlay technique is also used on furniture or decorative items such as panelling, especially in the Middle East and India, both these Islamic regions have a long tradition of beautiful parquet floors and artwork. The primary purpose of parquet is to cover the joists of a floor and provide a surface which is warmer to walk on than stone, marble or ceramic tile. Over the years, builders of less expensive homes have tended to install plain wooden floors because they are cheaper to manufacture, while homes for the more wealthy have historically incorporated more elaborate floors as a status symbol. Apart from its lovely appearance, wooden parquet is known to be extremely durable. Another of the most important benefits is because unlike other types of flooring, parquet does not trap moisture and rot in the floor joists, which is often the cause of damp problems with laying wooden floorboard planks. A parquet floor is sometimes referred to as mosaic flooring and is typically laid out in regular and geometric shapes such as squares or triangles made from wooden lozenges. The classic herringbone or chevron patterns shown below have been the most popular choice in the UK over the past century. Nowadays however, many discerning people are often requesting stars and sunburst effects or floral themes in their contemporary homes, so it seems there may be a revival taking place in modern home decor. Any species of wood can be used in parquet to create a pattern and much of its appeal is due to the use of various varieties of wood such as pine, walnut, cherry, lime and maple but the hardwoods are more prominent and oak is the most favoured choice these days. Sometimes the parquet pattern may be a subtle variance of grains between tiles in the flooring, while other floors may use strips of totally different colours. 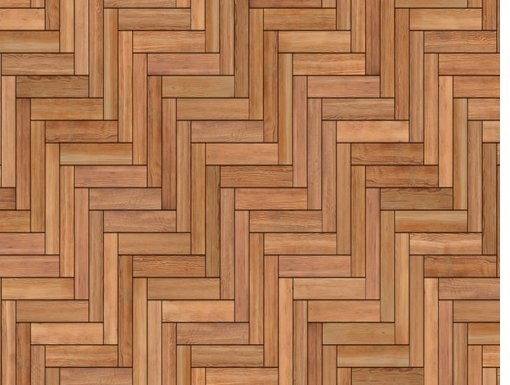 Classic parquet patterns include herringbone, chevron, brick and basket weave. Parquet floor installation is a job for an experienced professional. In days gone by it was laid upon hot bitumen, but today with advances in chemical technology, parquet flooring is nearly always installed using a cold adhesive which leaves each tile firmly fixed. Traditionally, parquet is made from solid pieces of wood cut in a tongue and groove pattern so that they can be fitted together. Because a parquet floor is completely solid, it can be sanded down and resurfaced many times as it degenerates with age. 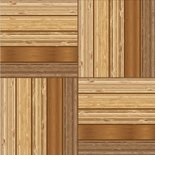 Nowadays parquet flooring can also be manufactured from engineered wood. Engineered parquet flooring is made from layers of different species of wood and topped by hardwood. Both types give the same final appearance when laid so the choice is not too important initially, and it is possible to lightly sand engineered parquet if the veneer is thick enough. However, there is a cheaper type of parquet on the market which uses a very thin strip of wood veneer mounted on particleboard. Some of this veneer can sometimes be sanded if thick enough, but most of these are not. The thickness of parquet may vary from as thin as 1mm to 15mm but great thickness does not necessarily equate to good quality or durability. There are some decorative 2 or 3mm thick parquet floors which were laid well over 100 years ago which remain very serviceable to the present day. Nowadays, the majority of parquet floors are created from solid hardwood at between 6mm and 10mm thick. This does not mean that you can save money by choosing thin parquet tiles, in fact the cost of parquet tiles made from common timbers is due to the work invested in their production rather than the type of wood used. Typically, parquet is fitted to a rigid base such as concrete or screed, and this has become possible with the advent of modern adhesives. However, it is the physical flexibility of thin parquets which makes them most suitable for fitting to flexible sub floors such as joisted floors. The easier it is to bend, stretch or compress, the less it is likely that the timber will become detached from its adhesive base. It is not advisable to fit parquetry thicker than 15mm over a flexible sub floor because the thicker the piece of timber becomes, the less easy it is to bend, stretch or compress. Even if the fitting of much thicker parquet tiles has been done successfully, it does not mean it could not have been done better or more economically with thinner parquet. As you can see in our section on parquet designs showing a few diagrams of the more common patterns used in the UK, there are endless combinations. Herringbone Parquet is named after the herring fish as it is known for being quite bony. This pattern came about when Roman road builders discovered their roads could be made a lot more stable by pointing bricks in the same direction as the traffic with each wooden block finishing perpendicular to the next resulting in a continuous broken zigzag design. It is perhaps the most popular pattern in the UK, and is usually made with wood of the same species. 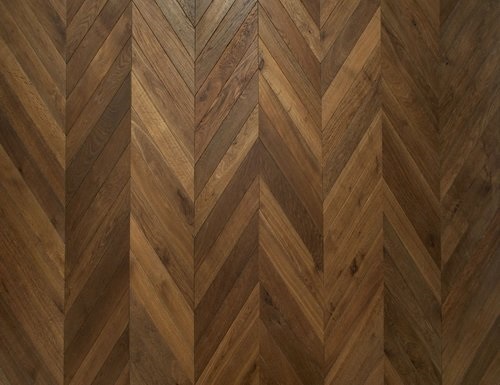 Herringbone battens are square ended as opposed to Chevron tiles, which are cut at an angle between 30 and 45 degrees. The wood blocks run point to point and the ends are cut at an angle and this also creates a zigzag design. Some people prefer to have a less complicated pattern such as Basketweave Parquet because its simple pattern blends-in and presents a better backdrop for rugs, ornaments and furniture etc. However, this pattern is created with smaller tiles which can be easily go missing and get lost forever if they become loose. Shabby looking parquet flooring is a sorry sight and can affect the entire appearance of a room, but the remedy can be a speedy and straightforward process for the Floorfixer Team who can restore it to its original beauty. Restoration can prove to be a worthwhile investment because a parquet floor is likely to be a valuable asset and will add value to your property. Restoring a Parquet Floor is by no means a job for an amateur, and the main reason we are so enthusiastic is because we actually enjoy our work. Our aim is to provide a friendly personalised service using top quality machines, products and skills.